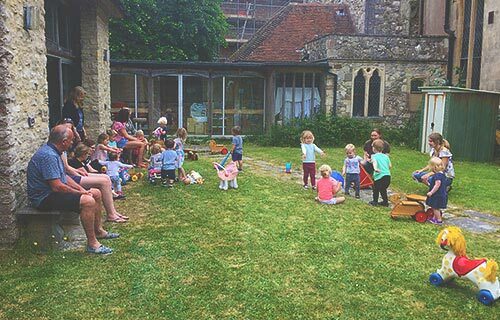 The Toddler Group meets every Tuesday morning during term time from 10 – 11.30am in St.Thomas’ Hall for children up to 4 years and their parents/carers. The Play Group was started in 1981 and continues to thrive with an average attendance each week of 30 children plus carers. During the summer we take advantage of the sunny weather and using the courtyard as well. As you can see from the photograph, it is a very popular space for both carers and children to play or sit and chat. If you would be interested in joining our team, either in the kitchen or with the carers and children, please get in touch. We have a rota so your commitment could be weekly, monthly or as and when convenient to you.